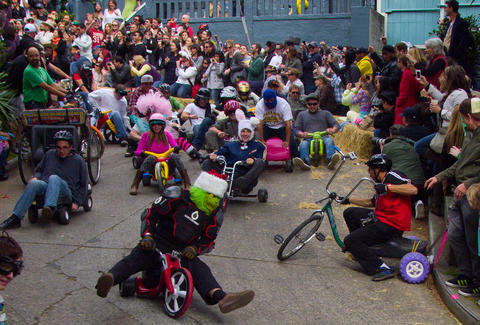 Nothing says "Easter in SF" more than hundreds of people in costumes crashing into each other as they race on Big Wheels down the crookedest street in the world (Vermont at 20th St, NOT Lombard, obvi). Because some people had family obligations (or sleeping ones) and couldn't make the race, we sent a dude out in a three-piece custom tailored bunny suit complete with one GoPro strapped to his bunny ears and another to the front of his Big Wheel and, oh yeah, a drone, to give everyone an up close look at what really goes down during the Bring Your Own Big Wheel race. Ross Barringer is a photographer (and middle child) living in San Francisco. His three-piece custom bunny suit is the only tailored clothing he owns. Follow him on Instagram @rossbphoto. Daisy Barringer is Thrillist's SF Editor. She is the youngest of three. When she was little, sometimes her big brothers would put her in a box and then push her down the stairs. She's totally over it though thanks to years of therapy. Follow her on Twitter @daisy.